Willie Nelson’s “Me and the Boys,” an album of classic country (seven of the 12 songs by Hank Williams) recorded with his sons, singers Lukas and Micah Nelson. 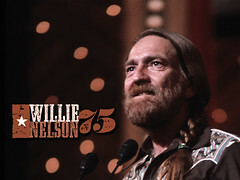 The original material were recorded at Willie’s Austin studio in 2011 by Willie and Lukas, with added vocals added by Lukas and Micah. In the seventh episode of the “Dave’s Old Interview Tapes” podcast, IndyStar reporter David Lindquist and guest Otis Gibbs (host of the “Thanks for Giving a Damn” podcast) revisit a 2000 interview with Willie Nelson. 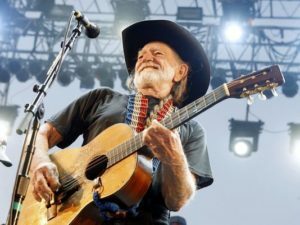 Willie Nelson enjoyed success as an A-list Nashville songwriter but he had yet to move to Texas for “outlaw” glory in 1969, when an onstage mishap damaged one of his guitars. That’s how Nelson acquired “Trigger,” the nylon-stringed and now lovingly distressed instrument that made history with the 84-year-old musician. Nelson talks about guitars and branching out to electric blues on the seventh episode of “Dave’s Old Interview Tapes,” a podcast that revisits IndyStar musical conversations between 1998 and 2004. Nelson talked to IndyStar before a Conner Prairie appearance 2000. In addition to audio from that chat, the podcast episode features commentary by Otis Gibbs — singer-songwriter and host of the “Thanks for Giving a Damn” podcast. Welcome to our second Washington Post Pop-Up Pop Podcast in which we discuss the great Willie Nelson and his legacy as a songwriter, a spiritual leader and a very funny dude. The discussion centers around an interview with Nelson that took place aboard his tour bus in Las Vegas earlier this month. You can read the profile that came from that interview right here and you can listen to our podcast below. 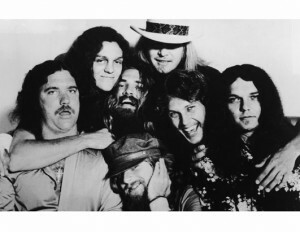 Budrock “Buddy” Prewitt, lighting director for Willie Nelson and Family, participated in an internet project about Lynyrd Skynyrd, the southern rock band that tragically lost band members in a 1977 plane crash — Ronnie Van Zant, Steve Gaines and sister Cassie Gaines. Several others were killed in the crash, and dozens injured. We ended up with a total of 6 shows. On 10/2 Ron kicks it off, Then Rosemary, Tim & Jack. Budrock gets the honor of having his episode release on the actual anniversary. Ken’s show is the final episode. Please make sure your subscribed on iTunes. It’s free, you can simply click the iTunes logo in my signature (on the footer) to avoid searching for the show. Paul also said that AudPod is launching a FaceBook page, where fans can follow along when the shows air, and if you are on Facebook, he invites you to become his friend, and a friend of the AudPod fan page when it goes up. 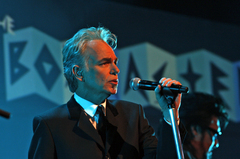 As it turns out, Billy Bob Thornton and Mickey Raphael have a lot more in common than both looking good in black suits and 50’s sleeked back greaser hairstyles. They both love music, they are very knowledgeable about music, and they are both are big Willie Nelson fans. Billy Bob and his band the Box Masters spent a month on the road with Willie Nelson & Family this spring, and Mickey would join the band on stage and play with them, before getting back to his regular job of playing harmonica with Willie Nelson and Family. 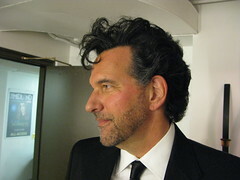 It was always fun to see him join WN&F after his set with the BoxMasters, all dressed up with his big hair. In between shows, on the bus or in restaurants, Billy Bob and Mickey would get together and talk about music, mutual friends and life on the road. Fortunately, someone had the good sense to record these conversations, and now thanks to Legacy Recordings, we can listen to them as podcasts. The interviews on the bus are appropiately set against the soundtrack of the road, with traffic sounds and honking horns. Billy Bob interviews Mickey about how he got started in music, his first musical performance (he played the triangle — who knew? ), and how he became part of the Willie Nelson and Family band. Mickey says that Willie never officially hired him, but that he never told him to leave, either. And there’s the story of Willie asking Paul, “What are we paying Mickey?” “Nothing,” Paul said. “Well, then double his salary!” Willie said. As a music lover and Willie Nelson fan, Billy Bob does a great job asking Mickey questions we’d like to ask him and we get to learn more about Willie Nelson and Family and their music. 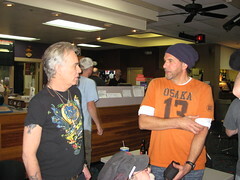 Billy Bob asks Mickey about how the ‘Naked Willie’ album came about. Mickey talks about buying his first Willie Nelson & Family album, and how much he enjoyed Willie’s guitar playing and his singing, long before he got to meet Willie through their mutual friend, Darrel Royal, coach of the U of Texas Longhorns. There was nothing simple about Chet Atkins’ production techniques, and the ‘Nashville Sound’ in vogue when he produced Willie in Nashville in the ’60’s. The recordings were heavy with layered strings and back-up vocals, which was what the public was loving and what they were buying. Mickey said he always wondered what the songs would sound like if Willie had been allowed to produce the songs himself. They were such great songs, he thought maybe they should be recorded again, but recognized that so much would be lost if they did that, because Willie’s original tracks were so beautiful. So, with Willie’s blessing, Mickey contacted Sony/Legacy who had acquired the RCA catalogue, and pitched the idea of re-producing some of Willie’s music from the 60’s and ’70’s, and removing the choral backup vocals, strings and “Nashville Sound” from Willie’s original tracks. “At that time in Nashville, artists weren’t allowed to produce themselves. I thought it would be like a gift to Willie, giving him control of the sound of those early recordings,” Mickey said. Mickey went to New York and got the original master multi-track tapes, had them transferred to digital and worked with another producer, Tony Castle, to remove the layers of stringed instruments vocals, and uncovered Willie’s guitar work and Willie’s voice that had been buried on the originals. So here are the podcasts. Thanks to Mickey Raphael, Joseph Vella, and Sony/Legacy for letting me share them here. Click on the link, and it will download to your computer, and you can listen to the recordings on your computer, or upload them to your ipod. Enjoy! 12. Where Do You Stand? 14. What Can You Do To Me Now?